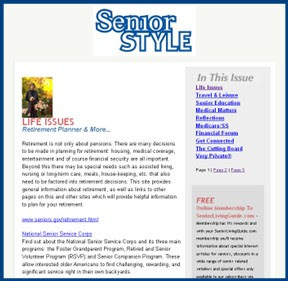 In our ongoing efforts to provide seniors and their loved ones with the most accurate and detailed information in the senior housing and services industry, SeniorLivingGuide.com will be redeveloping and distributing SeniorStyle – our online senior news and entertainment magazine. Here you will find articles ranging from finance and legal issues to what’s hot in senior trends, travel and entertainment. Look for our new issue coming January 2009!